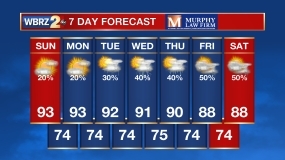 The week will end dry and hot. A cold front will offer much cooler and drier air by early next week. Today and Tonight: Friday will be sunny with highs temperatures near 90 degrees. Humidity will still be in check. Overnight will be clear with low temperatures near 68 degrees. It is Friday the 13th! Do you suffer from friggatriskaidephobia? Find out HERE. 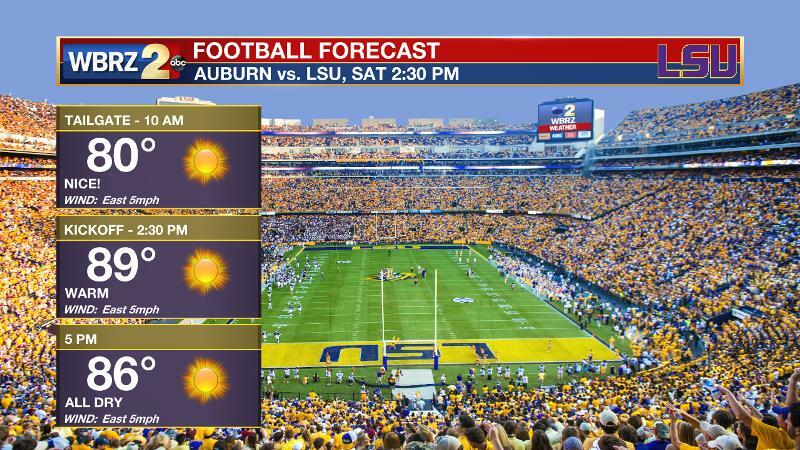 Up Next: As LSU plays host to Auburn, expect hot temperatures in Death Valley for kickoff time in the afternoon. Temperatures will be close to 90 degrees but it often feels much hotter in the stadium. For a mid-afternoon game, during the peak heat of the day, field level temperatures run 10-15° above the actual outdoor air temperature. Within the concourse, it could be anywhere from 15-20° hotter. The stadium temperature spike can be attributed to high solar radiation and poor air flow as the stadium creates its own “mini-climate.” In addition, a grassy field plus 100,000+ screaming, breathing fans (emitting water vapor) will produce an uptick in humidity as well. As we know, the heat and humidity combination produces an even higher “feel-like” temperature. Wear sunscreen and hydrate. Some humidity will sneak back into the area on Sunday with the possibility of an isolated shower. A cold front will move through the area on Monday. While widespread showers and thunderstorms are not expected, a bigger drop in temperatures and humidity is anticipated. Tuesday and Wednesday will bring highs near 80 and lows in the upper 50s. The Tropics: Ophelia has now become the tenth straight named storm to reach hurricane status, tying the all-time record set in 1878 and equaled in 1886 & 1893. As of 4am Friday, Hurricane Ophelia was located 615 miles southwest of the Azores. With maximum winds of 105mph, the system was accelerating east, northeast at 8mph. 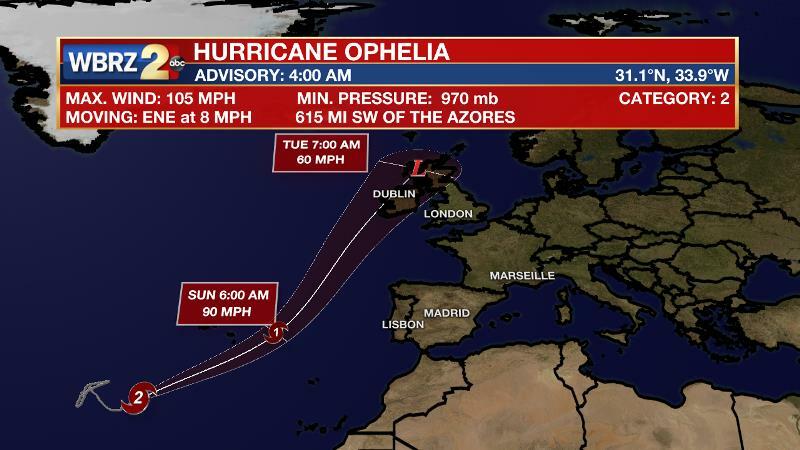 On this track, Ophelia is expected to pass between the Azores and Cabo Verde Islands, passing west of Portugal, possibly affecting Ireland early next week. A 500mb ridge will remain over the region through Saturday. Moisture return prior to the next cold front will begin on Saturday night. This will result in a return of showers and thunderstorms, at least south of I-10, on Sunday and possibly Monday. The cold front itself will pass through the area on Monday. Moving beneath the remaining ridge over the Mid-South, the cold front will struggle to produce much rain due to a general sinking motion in the atmosphere. However, this front is expected to have a successful southward push and therefore will bring cooler an drier air to the entire region. This refreshments will not be there long through, because a tropical wave will move into the north central Gulf of Mexico by Wednesday. Clouds and showers will increase later in the week, especially for areas closer to the coast. Temperatures should only recover to a few degrees above average by the end of next week.